Initial calibration Aug 1, 2017 to Sep 18, 2017. 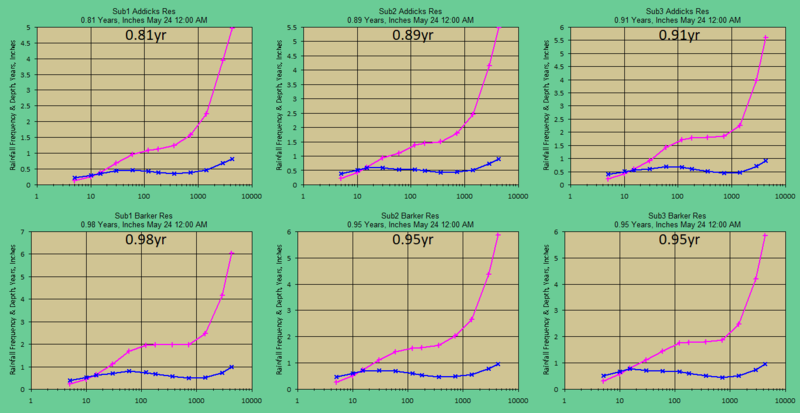 30 Inch 2000 Year 3-Day Area Rainfalls??? 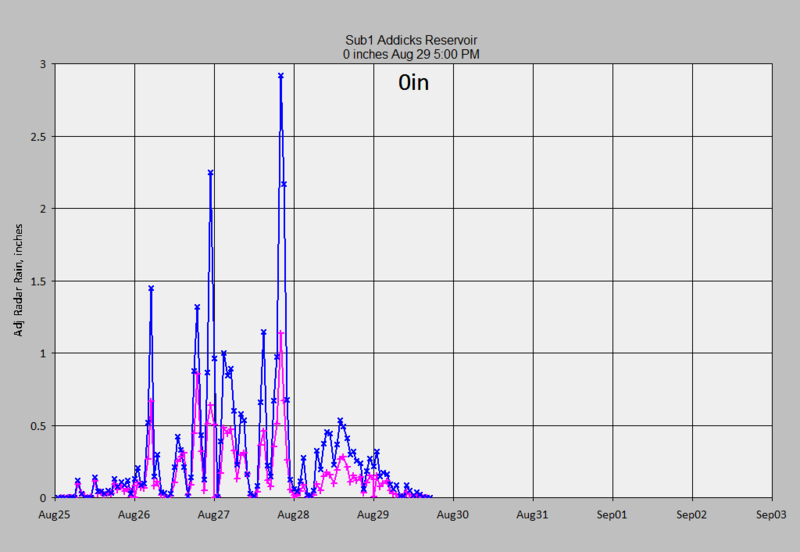 August 1 to Sep 18, 2017: 5-minute NEXRAD N0Q radar, rain gages, and USGS elevation and release gages was downloaded with my free GetRealtime for both Addicks and Barker flood control reservoirs. This period was run to adjust runoff coefficients to match USGS reservoir levels and releases. 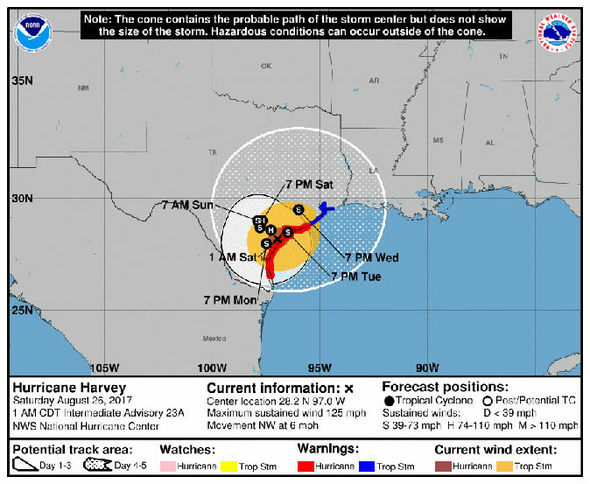 These initial calibrations with 30" rainfall of Hurricane Harvey are discussed and shown at bottom. Just below are current GetRealtime rainfall, lake levels, and my forecast releases for both Addicks and Barker reservoirs. The reservoir releases are actively operated by USACE to minimize downstream flooding so take my rated release forecasts with a grain of salt. 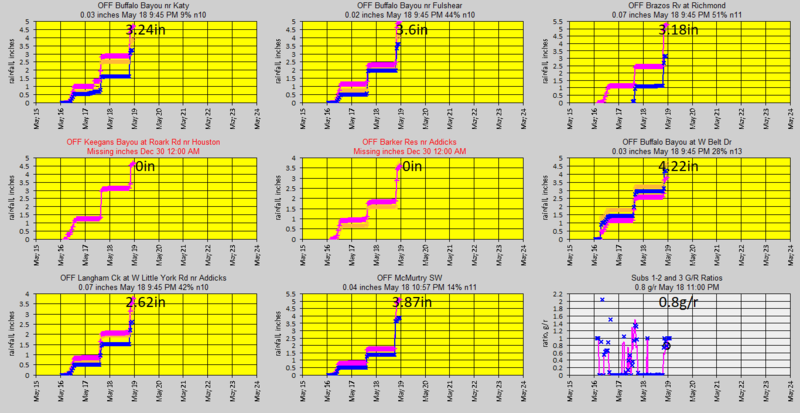 The NWS and USACE consult for their downstream forecasts. 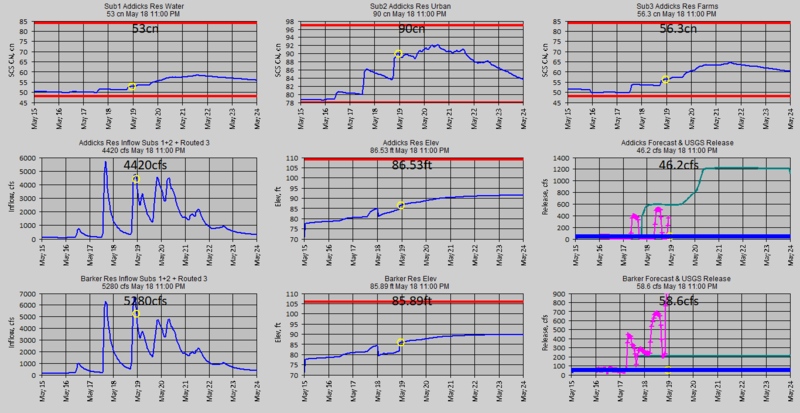 I'm not in their loop but I'll add the NWS forecast flow trace to my graph below when available. 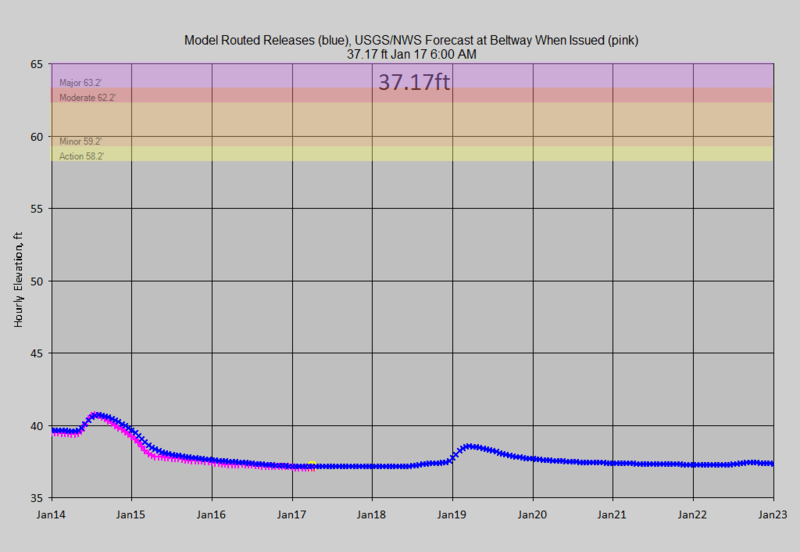 The point here is to show reservoirs that do not have USACE/NWS consulted forecast releases can still be provided with flood forecasts given a guesstimate of a release rating. These two here are the most actively operated reservoirs that I have modeled, so smaller reservoirs also can be modeled with GetRealtime's Modpul reservoir techniques (see my Ashton OR irrigation reservoir and my Dalton GA 2 water supply and sportsman reservoirs web page examples... and Sonoma CA reservoir on my website map page. If you want to operate Grand Coolee's powerhouse with GetRealtime then just shell Hec-ResSim. Alert triangles on stage forecasts > 50 ft ... and can be emailed. My release ratings are based on the Big One of 2017. Almost anything less can be stored so that only the 35 sqmi side inflow below the 2 reservoirs matter. Caveat emptor until full. Just keeping you awake. Looks like for less than hurricane size rainfalls, like the stalled Jun 20, 2018 Tropical Depression, in addition to GetRealtime routing option 'RELEASE 1410 -1 rhour' a low rated flow Modpul should normally be used to project last hours reservoir release for the next 7 days. 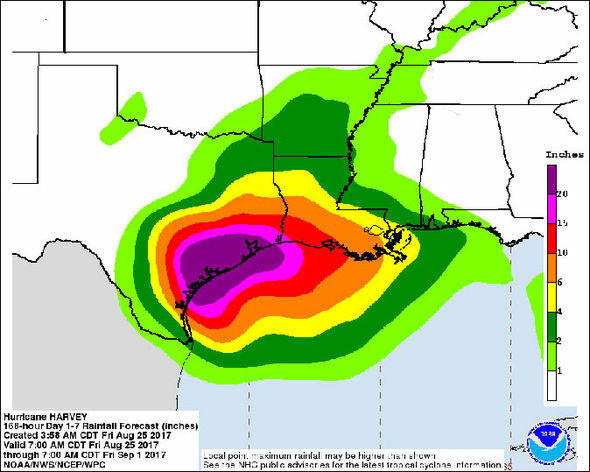 One has to remember to use the high flow modpul rating for projections should a hurricane come into play. My current low flow modpul rating goes to hurricane levels above a selected high reservoir level (95 ft) so that may still be a good way to go. Addicks s411 reservoir water area, 21.20 sqmi. Addicks s412 urban area, 63.94 sqmi. Addicks s413 farm area, 48.27 sqmi. Barker s421 reservoir water area, 19.31 sqmi. Barker s422 urban area, 69.70 sqmi. Barker s423 farm area, 45.20 sqmi. Update 6/20/2018: The 5 ratios were replaced with 2 ratios, 9 Wundergages for Below Reservoirs and Subs 1 & 2 in both reservoirs. 5 Wundergages used for Subs 3 in both reservoirs. The period 6/9 to 6/20/2018 was rerun with very little difference. 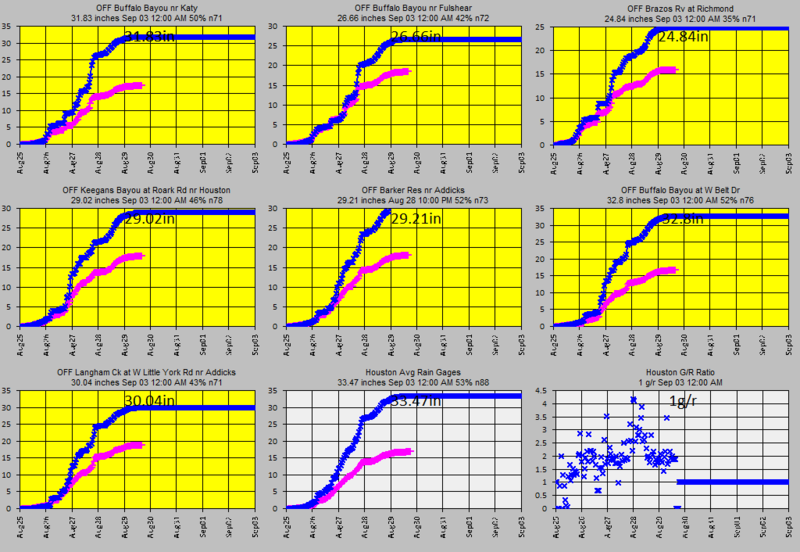 The adjusted radar (9 Wgages) at 5 USGS gages are now being evaluated instead of 2 USGS gages vs a whole subbasin with much better correlation but are still over estimating the USGS gages. The single subbasin below the reservoirs probably need a separate ratio adjustment with 2 GOOD Wundergages will be looked at next but will be back where I started. 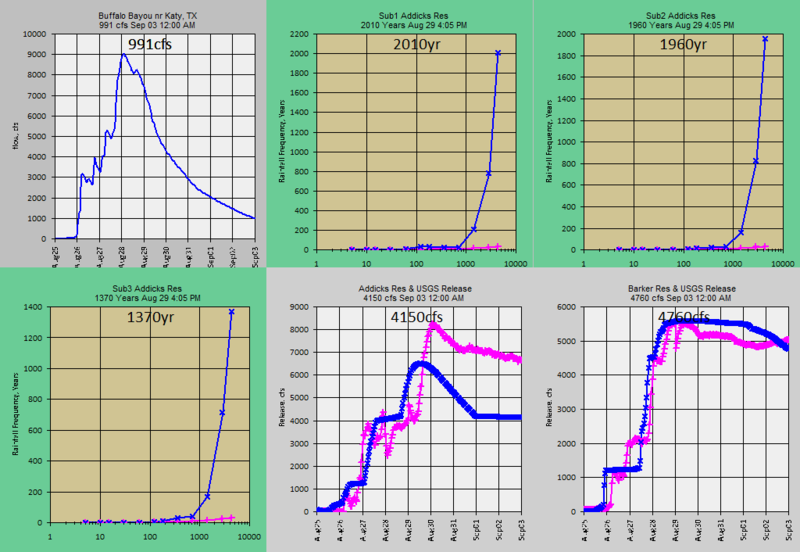 Update 12/08/2018: The peak below the reservoirs was a 2000 year flood while the rainfall was a 3 year event. 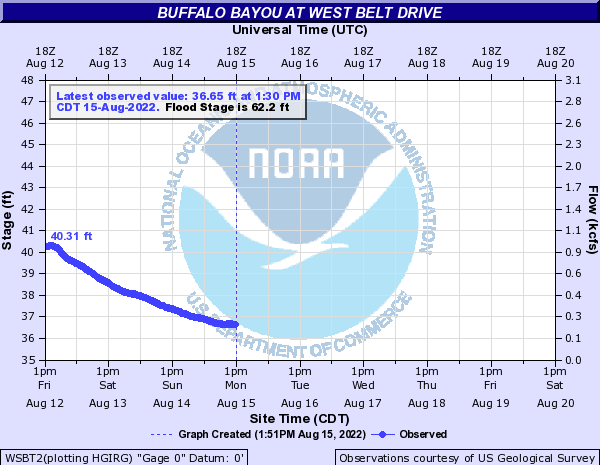 Changing the Curve Number for the below res basin to match the peak was unrealistic. Instead of using an off the shelf 35 sqmi basin boundary below the reservoirs, I re-digitized catchments with Google Earth Pro and and got a 22.4 sqmi subbasin. I lowered the Curve Number loss from 70 to 64 and increased the Clark unit graph storage factor from 1.5 to 3.5. Still needs broken in to 2 subs but that's another day. 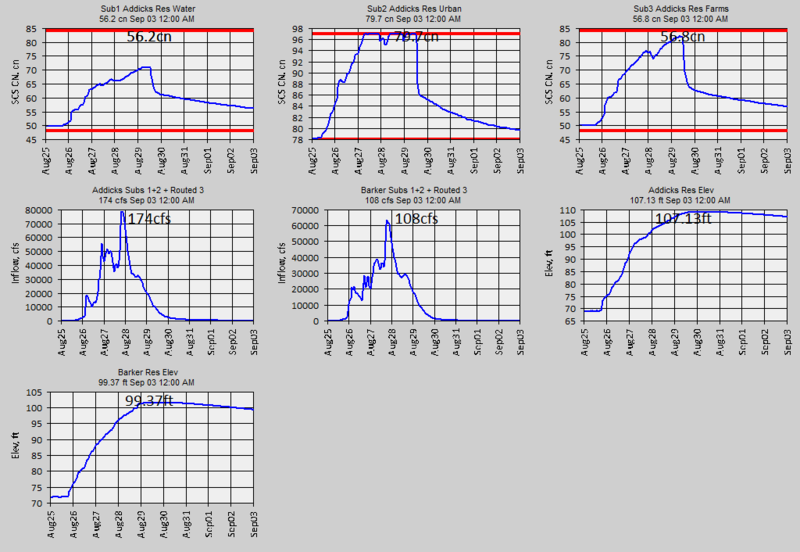 Now the model matches the USGS peak and the 3 year rain produces a 6 year flood. Also my basin total sqmi of 290 matches the USGS. 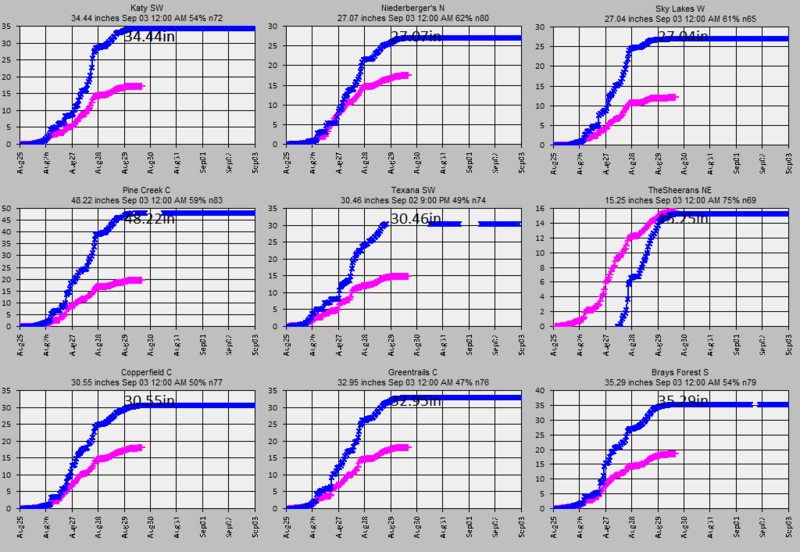 The 6-hour block 7-day NWS forecasts are distributed to 5-minutes using my Vegas distribution and nowcasts based on winds aloft are limited to next 3 hours with 3 addionial hours using HRRR multi radar multi sensor radar forecasts. My 3-hr Nowcasts are being evaluated on my web page here. The elevation-release-capactiy tables for the 2 reservoirs were constructed (cough) using actual operation data for August 1 to Sep 18, 2017 USGS pool elevations and downstream flow stations. The storage and release were used to calibrate the runoff coefficients for the 3 subbasins in each reaservoir. 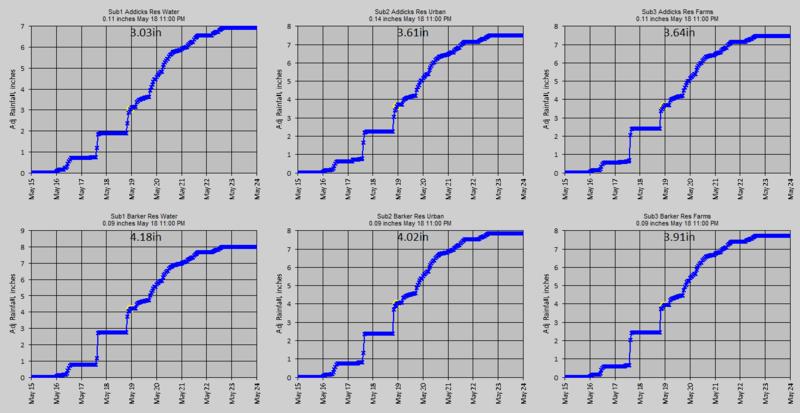 Real-time forecasts of storage and release for the next 7 days by GetRealtime uses the actual starting pool elevation and current release if less than my constructed release rating here. The intent is to use current USGS release value as next 7-day schedule but allow for higher forecast releases for forecast storm runoff inflow. GetRealtime routings have several options on how to operate a Modpul rating with scheduling. I would be happy to send anyone all my database data and setups if they would like to put some more refinement effort into any part of this for their own use. I think the Barker calibrations worked out better because of possible less of less gage backwater. You can see I never got all the rain volume that releases show out of Addicks. 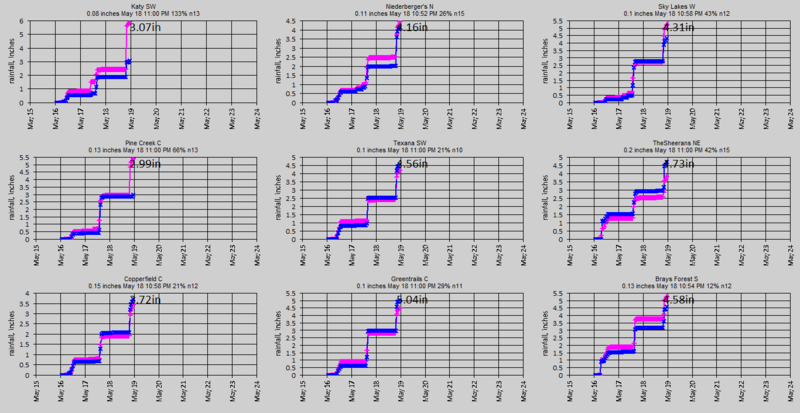 Also I had to compute the missing Addicks releases for the peak period (I think the USGS is updating the rating and may fill it in so that might help a lot). 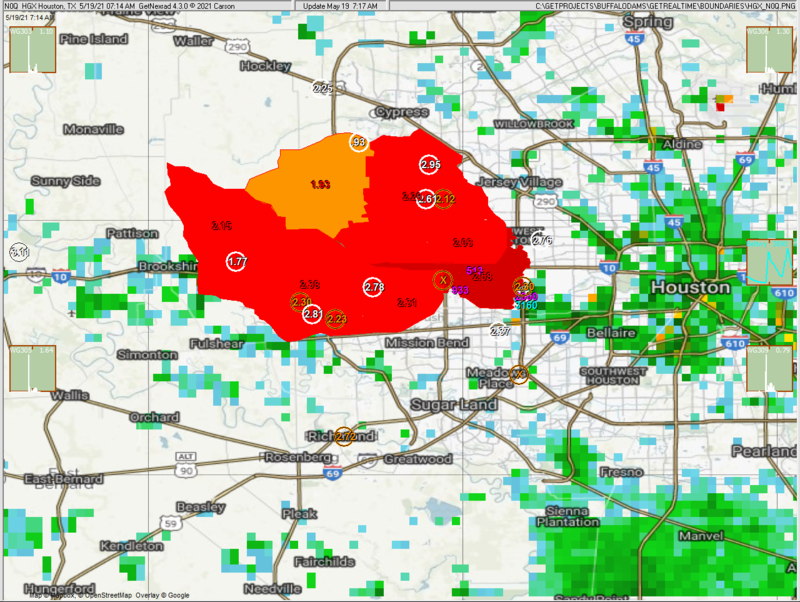 Update: Now that I think about it, I was trying to kill 2 birds with one run... both calibrate the runoff inflows and develope a release rating. 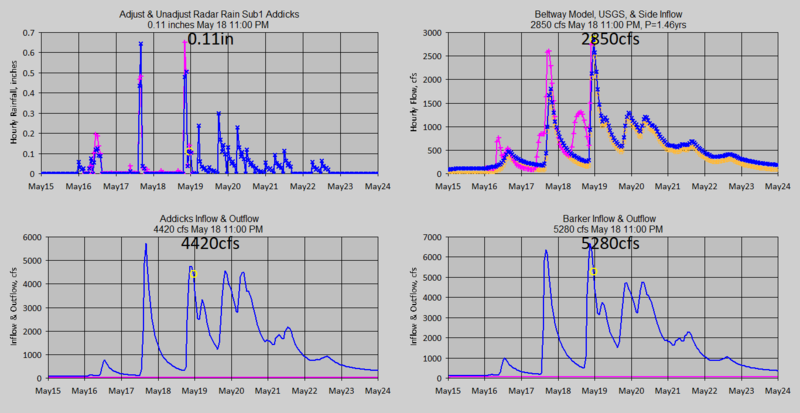 I should have set the releases with my RELEASE method to use USGS actual releases to calibrate the runoff inflows to match pool elevations AND THEN run and jiggle the Modpul release rating to some what match the USGS elevs and releases. Seems ok for now so there's always the next project... and Wunderground rain gage graph 6 below should have been turned off... do you see why? Texas has no Atlast 14 yet so this Atlas 14 table is for a point at the Louisana state border near Interstate 210. Copyright 2017-2019 Carson, Reproduction permitted with attribution.